MERIDA, Mexico – The 18th century Hacienda Xcanatun, pronounced (ssh-kana-toon), a former sisal hacienda turned into an elegant, boutique hotel, is introducing in 2010 a Best Available Rate program valid until September 30, 2010 The offer is limited to a set number of rooms, and some restrictions apply. (See below. ), but the savings are significant. 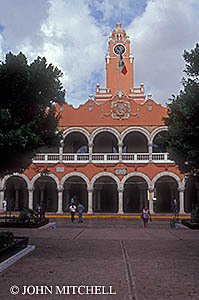 The Palacio Municipal on the main square in Merida, Yucatan, Mexico. Click on photo for usage info. gourmet restaurant, named one of the top 50 in Mexico, and an intimate spa. made by calling toll-free US/Canada 888-883-3633 or 52- (999)930 2140.
details, the website is at www.xcanatun.com.